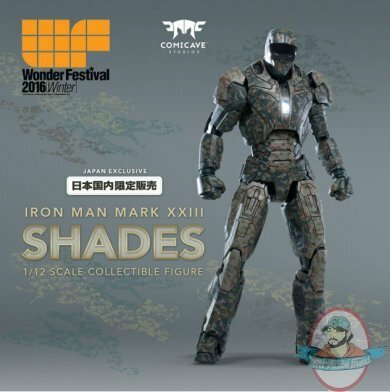 This Japan Wonder Festival exclusive of Iron Man's specialized armors from Iron Man 3 will be available in limited quantities! We've managed to secure a small qty of this item for you! Don't forget to pre-order SAMV12IM43N Comicave Studios Iron Man MK 43 from Avengers Age of Ultron too! A unique armor with military camouflage garb made of 75% diecast and features LEDs in eyes and chest with interchangeable hands and display stand as well as effect parts.